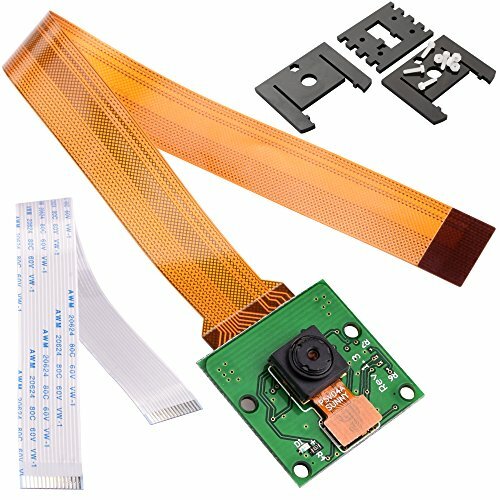 The Kuman Camera Module is a custom designed add-on for Raspberry Pi. It attaches to Raspberry Pi by way of one of the two small sockets on the board upper surface. The camera is supported in the latest version of Raspbian, Raspberry Pi's preferred operating system. The board itself is tiny, at around 25mm x 20mm x 9mm. It connects to Raspberry Pi by way of a short ribbon cable. This interface uses the dedicated CSI interface, via the CSI bus, a higher bandwidth link which carries pixel data from the camera back to the processor. The camera is capable of 2592 x 1944 pixel static images, and also supports 1080p30, 720p60 and 640x480p60/90 video. Black acrylic Adjustable mount, allows for different angles of repose,and 4 screws to secure your camera.